Camping is a favourite recreational activity in many parts of the world, where there are natural and recreational parks, vast wilderness, and diverse wildlife. It is one of the best ways to have fun in the great outdoors. Australians in particular love camping. Who wouldn’t when your country is a vast camping site? With large areas of the Outback unexplored, Australia is truly endowed with natural resources. The whole country is a camper’s paradise. Here, you can go camping with your family, even with little kids in tow. You can also spend it with your backpacker friends, or on your own especially when you want to have that ‘me time’. You can have it short on a day trip, on weekends, or if you so desire, for as many days as you want. You can go camping during break from your work, studies, or other responsibilities. Do you plan a camping trip? Most campers spend time planning their camping trip. You would most likely do a lot of research on ideal campsites, check out stores, or shop online for camping gears, and conduct other preparatory tasks to make sure that it will be a successful and enjoyable adventure. Whilst planning is a good habit, there comes a time when you just want to ‘go with the flow’. After all, a spontaneous camping trip can bring tremendous surprises and excitement. The moment you decide to push through with the trip, the thrill begins. Having an RV is like having a second home, on wheels. You can equip it with all your home essentials. You can even bring along your own inverter generator to power amenities, gadgets, and other equipment that make your life easy and comfortable. As such, even in the midst of nowhere—under a moonlit or starry night—you could still enjoy the comfort of your home. You wake up one fine morning and suddenly decide that you want to surprise your family by taking them to a weekend camping getaway. Is it possible? 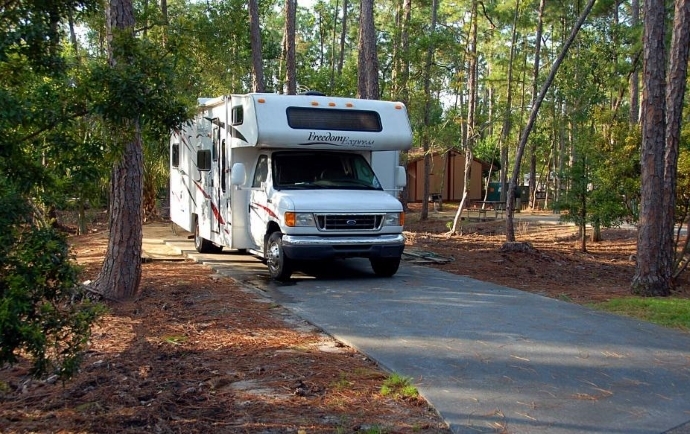 As long as you have the time and a fully-equipped RV, you can do it. A recreational vehicle is a big advantage for camping enthusiasts because it can store all the gears, equipment, and supplies you need for an instant trip. Just observe the following. The trick is to be prepared at all times so that you are ready to go at the drop of a hat. Your preparation would include a checklist of pre-stacked must-bring items. Your inventories should consist of camping gears and accessories, personal items like clothes, cooking and food supplies including water, beddings and linens, as well as toiletries, and others. Equip your RV with camping essentials, gears, and accessories such as the following: torches and flashlights, tarps, foldable chairs and tables, umbrellas and raincoats, and extra batteries for your gadgets (if you don’t have a portable generator or solar panel for charging). Stock up with canned goods and other grocery items. Linens, beddings, and towels can be kept in cupboards inside your RV. Most RVs can be equipped with kitchen and home appliances such as refs, stoves, air cooler, and an AV entertainment system. Make sure that you keep these items in good working condition. 3. Pack clothes and personal kits ahead. Pack a bag or knapsack with clothes and your personal kit and stow it in your RV. You may also put everything you need in sets that you can put in your backpack and take out anytime. 4. Pack assortment of non-perishables and non-food camping supplies in plastic bins. Plastic bins would contain lighter/matches, cutting board, knife, can opener, salt and pepper, mugs, paper plates and cups, paper towels, and hand towels. A mini bin which can be put inside the larger bin can contain a package of ground or instant coffee, tea packs or tea leaves, sugar, and creamer. The same thing goes for your toiletries: soap, shampoo, hand soap, rolls of toilet paper, and dental care items. You can stack your supply bins in the RV or store them in your pantry or storage area. Make sure that you replenish used-up items with fresh packs after each trip. Likewise, label each bin properly so you don’t need to bring out all its contents when you are looking for something. 5. Take advantage of technology. If you really want to be spontaneous, technology can be your best companion. Your smartphone is most useful when you go on either a short or long trip. You can load it with apps like maps, GPS, and others that can assist you in getting information that you need instantly to know your way around. Most importantly, it can help you call for help during emergencies. Whenever you decide on a trip, you can grab your bags, bins, and go. You can make a short stop to shop for perishables along the way. Enjoy!